PictureRelate 2.6.3 free download. PictureRelate compares pictures by similarity. With a bit of experience you can browse your pictures by similarity by choose a picture close to what you are looking for, adjusting feature weights to fit your criterias, select a more similar picture, and repeat this process. For ease of use PictureRelate supports browsing, viewing, renaming, deleting, etc. You can copy and paste and drag and drop images from PictureRelate to other applications or to the desktop and from other applications and the explorer into PictureRelate. 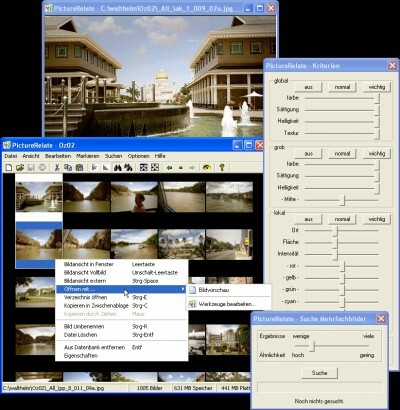 Configuring custom tools to manipulate images in a "Open with" context menu is supported. PictureRelate is specifically designed to work with a large number of pictures. 50.000 and more pictures are still searchable easily and quickly on a modern PC, once the database is built. Image Processing Wizard is a fast, reliable and easy-to-use software tool, useful for batch resizing digital pictures and quickly adjusting their quality and file size. ImageSorter is a graphical media browsing tool which will allow you to automatically sort any pictures by color similarity (and thus by image content). An image browser with a full-screen slide show, image sorting, and a printable contact sheet.